I o nly have one boy (as a complement to his older sister) and must say, his aim and concentration in the pee-pee department has always been admirable. Without the aid of cheerios or other floating targets, he stays inside the lines, and rarely have I seen him paint the walls. However, I have known little boys who can barely stand still, and who likely unzip and let it rip, ricocheting their spray off the sides of the toilet. I imagine this is the everyday cleanup problem the inventor of the Flippee Toilet Shield had. Annmarie Vanini, the inventor, is the mom of three boys. I can only guess how wide of the target they must have hit before she took pencil to paper and invented this gadget. 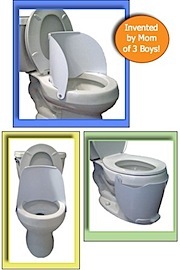 At $24.95, and available from Potty Training Concepts and Flippee.com, you might be surprised at how simple it is. It’s lightweight and very flexible, but does what it says it’s supposed to do. If you need it, and you know who you are, this is probably a small price to pay. Necessity is the mother of invention, for strange, other-wise useless gadgets. Now if we could only get my son to learn to be as self-sufficient when it comes to #2.